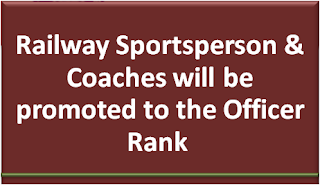 Union Minister of Railways, Coal, Finance & Corporate Affairs, Shri Piyush Goyal has approved a new policy for promotion of Railway Sportspersons whereby in addition to the sportspersons who won a position/medal in Olympics, all those sportspersons & coaches who have been awarded with Padma Shri will be promoted as officers. In order to give due recognition to the effort put in by the sportspersons, who have made two appearances in Olympics, won a medal in Asian Games/Common Wealth Games, it has now been decided to award them with a promotion to the officer rank. 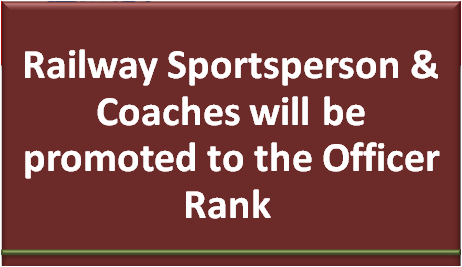 Further Railway sportsperson who are winners of any of the awards like Arjuna/Rajiv Gandhi Khel Ratna Award would also be entitled to the said promotion. The contribution of the coaches to the successful performance of sportspersons has been duly acknowledged & any coach whose trainees have produced at least three medal winning performances in Olympic Games / World Cup / World Championship / Asian Games / Commonwealth Games including at least one medal in Olympic Games would be eligible to be promoted as an Officer. In April 2018, during the felicitation function organized by Railway Sports Promotion Board for the medal winners of CWG 2018; at National Rail Museum, Shri Piyush Goyal had announced that Railways would soon come up with a promotion policy to address the legitimate aspirations of the outstanding Railway athletes; whereby not just medals but the effort put in by sportspersons would also be acknowledged. The Minister had also emphasized the role of coaches in producing successful sportspersons.